⬅ Want Some GM Loving? As you’ve may know, I’ve recently started a (sporadic) 2nd edition AD&D campaign—Gloamhold: Adventures in Shadow. After only the first few sessions, I’ve been struck how the game play differs to our normal Pathfinder game. Obviously, mechanically the two systems are wildly different. This post is not about these differences. (It would be rather long and rather boring, if it was.) Rather, I’ve been fascinated about how actual play differs between the two editions. The play’s the thing, after all! Playing Pathfinder we roll two sets of abilities using 4d6 (drop the lowest), pick the best set and arrange as desired. Playing AD&D we rolled 3d6 twice for each ability and kept the best result. To ensure a balanced party, each player could swap two stats around. (This helps ensure everyone gets a class and race they want to play). Still, even taking this out of the equation, the PCs are undoubtably less capable and less robust…and it turns out that’s a good thing! In their first foray into Greystone, the party had two encounters which would have gone markedly differently if we’d playing Pathfinder. In the first encounter, the party met—and retreated from—some kind of sentient seaweed creature. If we’d been playing Pathfinder, they would have made knowledge checks and then slaughtered it. Playing 2nd edition, they immediately backed off and talked things through before deciding to leave it alone (for now). By then, no doubt, they’ll have plotted some kind of tremendously clever plan to deal with it. In the second encounter, the party released—or almost released—three ghouls from their den. In Pathfinder, one of the fighters would have blocked the corridor, gone total defence and let the cleric destroy it with channel negative energy. In the actual session, the appearance of potentially powerful undead caused consternation—and a smidgeon of panic—among the party. We rolled initiative and combat began but before the ghouls could escape their lair one of the party slammed the door shut. (We left the session there so I don’t yet know what they plan to do). It seemed the party were more inventive in general game play—probably because they didn’t have loads of skills and feats to fall back on (although we use the nonweapon proficiency rules). I didn’t hear the words “I make a (insert skill name) check” at all during the session (except—sort of—from the thief). That was tremendously refreshing. Several of the players in particular hurled themselves into this “new” way of playing and went to town coming up with inventive solutions to problems. It seemed the players listened more to the various area descriptions and suchlike—and to the answers to their fellows’ questions. To my mind, we spent less time focusing on mechanics—“I make a (insert skill name) check”—and instead listened to each other before asking pertinent follow-up question or observations. Again, this was tremendously refreshing as everyone seemed a little bit more engaged than in a normal session. (Of course, this could be wishful thinking on my part). When we play Pathfinder, most of us use iPads—Shiny, shiny and wonderful (and distracting) iPads—to run our characters. Playing 2nd edition AD&D the players all used physical character sheets and pencil—the horror! Cue loads of bad jokes about finding a new app called “pencil” that was compatible with character sheets etc. Still, there were no glowing screens at the table to distract us. (Perhaps this helped with “Actually Listening” above.) Don’t get me wrong, many of us swear by iPads when running our complicated Pathfinder characters. However, the siren’s call of the other apps—and the web—lurking on an iPad leads to distraction and confusion. It’s somewhat harder to get distracted by a pencil and a piece of paper. We’ve only had a couple of sessions, and so these are my initial thoughts. They may change—they may not. If they don’t, however, I’ll certainly be giving more thought about how to incorporate the positive above into our normal Pathfinder game. In any event, I’m looking forward to more Gloamhold: Adventures in Shadow! What do you think? Am I right about the way the different systems play or am I talking rubbish? Let me know, in the comments below. Pretty much spot on, IME. Different games have different play experiences. 2e is far more of an exploratory game, if for no other reason than that you need to pay attention and go slowly, or you will die. That’s why first edition and second edition are so great because it’s less tools & more imagination play. In my own opinion its the way it’s supposed to be played. leave the real world and play in The Relm! I think it’s a matter of perspective. I grew up on Basic D&D, worked through AD&D, 2nd edition, was a playtester on 3.0, upgraded to 3.5, Pathfinder, D&D 5E. 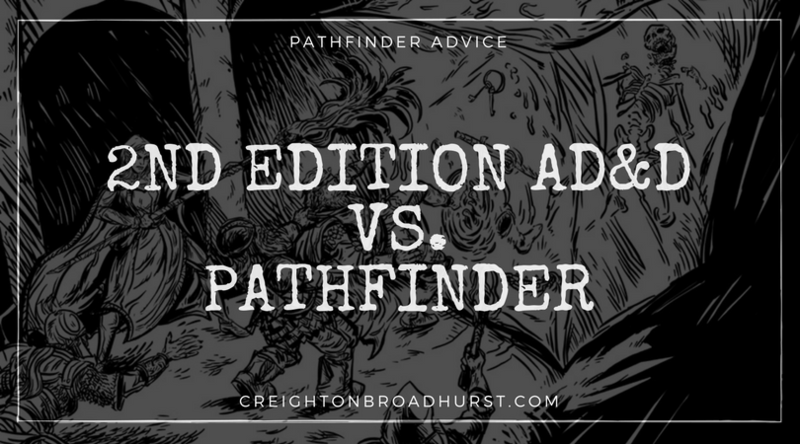 Pathfinder shines regarding in heroic fantasy – if you want to be larger than life, have clearly defined actions/reactions, and enjoy the number crunch, it satisfies all of that. Older versions aren’t necessarily more inventive, they are so as a result of not having defined actions/stats for almost anything imaginable. While there’s a satisfaction in knowing an exact rule for Bull Rush, it also means that’s in your list of options as you play your character. You can do A, B,C, but can’t do X, Y, Z because . That’s artificially limiting in a way that AD&D wasn’t – there are less things defined, so your options are whatever you can think of. It’s up to the DM to adjucate whether it works or not. That’s a very different experience than Pathfinder. If you want to allow more options in Pathfinder, the GM only has to allow players to do things beyond the pale. I had a 2nd edition player try out Pathfinder and they wanted to jump on the back of a demon, throw a silver chain around it’s neck, and throttle it in one round. Strict Pathfinder wouldn’t allow this kind of movement and attacks, but I did, because it was cool and fit the heroic idea of the combat. That’s how you make it more organic, by allowing it to be so and rewarding the players by allowing them to go beyond the rules. I love the last part of your comment–“to go beyond the rules.” Very cool! Before I comment, I want to try this. It sounds like your Pathfinder issues are exacerbated by some choices you made, like dual rolled stats rather than Point Buy, and the use of ipads at table(!). Possibly you PF games also emphasise balanced fights. I’m running a bit of 2e currently and it feels a lot like 5e. Our 5e and Castles & Crusades games feel quite different from our Pathfinder games. There’s quite a bit more freedom for some reason. Different games bring out different play styles. It’s quite a bit more loose and that’s very refreshing! My experiences mirror yours precisely. Although I don’t play Pathfinder, I know enough to say you hit this comparison on the head. As an older gamer, I grew up with that play style…so it is natural for me. I just can’t imagine playing a game where my players are just throwing around skill checks and not actually solving problems. A well written piece! Sometimes in 2nd ed, you had to pay close attention to the GM because there was so much GM Fiat. More broadly, my experience of 2nd ed is that characters were tools players used to solve problems. In PF, characters are roles the players perform. “More broadly, my experience of 2nd ed is that characters were tools players used to solve problems. omg this is a beautiful statement. poetic and true. You’re right: leave Pathfinder and go on with AD&D. New roleplaying games are all hat and no cattle. Creighton Broadhurst, thank you ever so for you post.Much thanks again. Totally agree. I came from the AD&D period and moved into Pathfinder about 10 years ago. I am now restarting AD&D because of the focus on story and in game interaction rather than the reliance on skills and die rolling. Great post! I pretty much agree with your findings. I’ve been running or playing PF since it came out, while running a solo 2e game less frequently over the same years. I’m enjoying the more open-ended or “rules light” feel of the older game. When 3e came out, it was everything I’d always said I wanted. DMed some and before we even hit 6th level I was seeing that this was a monstrously complex game that drowned the bits of RPGs that I most enjoyed. I went back to playing 2e, though I happily cribbed some 3e stuff (mostly from the Book of Vile Darkness). Different strokes for different folks, of course. I’m currently having a great time running 5e. Sounds actual run and refreshing. If you could be bothered to list which books are you using? I have thought of doing the same but unsure of what book’s to purchase? For 2e I use the three core books and that’s it–the PHB, DMG and MM. For Pathfinder I use the core rulebook and the Bestiary. Sometimes, I get nagged into using some of the APG! Oooo you are coming around to my way of thinking. This is exactly why my group still plays a modified version of 2nd edition. We believe you still have to play smart & as a group to survive. Don’t get me wrong, we have stolen a few rules from the other versions, such as spontaneous casting for clerics. A few spells from 3.5 to name a few. The earlier game mechanics feel more about tactics and team play then the later versions. I will say the later versions hands down have much better story lines and reasoning behind the moduals. So when I DM, I steal the modual concepts & monster design from the later versions and mesh it all together for a modified version of second edition. I´m not a fan of Pathfinder at all. And while i played 3.x, 4th, and 5th (a lot of 5th), none of that versions can compare to anything from TSR. The old way of gaming was so evocative. New systems are more clear and easy to understan, but not more engaging nor fun. Sorry my bad english, greetings from Argentina! I think a lot of those differences were the players themselves doing it differently. You can definitely play Pathfinder with that AD&D style: with just character sheets, rolling 3d6 stats in that manner, and trying things with the DM making judgement calls. AD&D lends itself to that style more for sure, but almost any mechanics system can be played in that fashion. I do prefer AD&D myself. The fragility of characters and no CRs or ECLs mean the PCs only have a rough idea of what they can take on, so taking risks or being careful definitely come into play more often in my experience. The way AD&D handles magic and magic items is also more to my taste. One of the issues my gaming group and I have had is that we have become too accustomed to the modern way systems work – With skill checks to cover everything, and like the Bull Rush example, codified rules to handle situations that used to be freely adjudicated by the DM. It has made us realize that after 30+ years of playing D&D, we don’t know how to play in the old style anymore, and we are having to put a lot of effort into trying to go back. Pre 3ed, 2E had volumes of material, players everywhere and it was overwhelmingly the RPG of choice. The only reason 3ed was issued was to sell core books and simplify the game. Allegedly appealing to a wider audience. The strategy backfired, split the market and WOTC lost control of the RPG populace. Creighton, I have had similar experiences with my group. 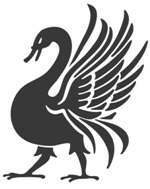 We are currently running a First Ed. game variation. No tablets or phone apps, just old fashioned interaction between players and GM. This is what drew me to RPG in the first place. My players are flourishing. They are finding new and inventive problems solving and using their wits instead of their dice. The results: Great play and everyone feels good about their accomplishments. It’s not about the rules, it’s about the play! I typically play pathfinder, but a recent addition to the friendship circle has added an old school DM who predominantly runs ad&d. They both offer some wild differences in gameplay, heroic fantasy Vs realism, and I have to say both are great. I agree in finding more engagement around the ad&d compared to pathfinder… And I’m about to run barrow maze for the first time this year in ad&d format.